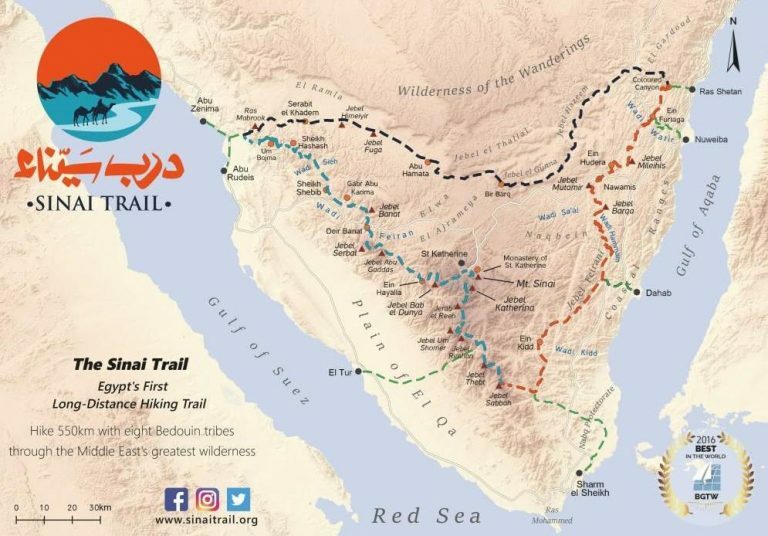 The Sinai Trail is a triangular ‘circuit’ that totals 550km in length and which takes most people around 52 days to walk, if all major mountain peaks on the way are climbed. We have shown each side of the Sinai Trail ‘triangle’ in different colours in the map below. The easterly side is orange (running from the Coloured Canyon to Jebel Sabbah), the westerly side is turquoise (going from Jebel Sabbah to near Ras Mabrook) and the northerly side is dark blue (running from Ras Mabrook to the Coloured Canyon). 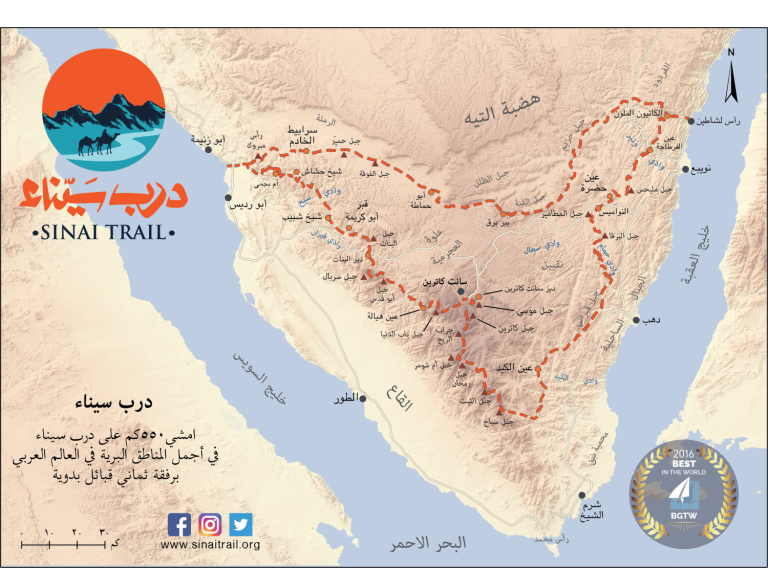 You can walk the whole Sinai Trail, doing the entire ‘triangle’: most people who do this start at Ras Shetan and walk it clockwise, heading south west to Jebel Sabbah, then north west to Ras Mabrook, then east back to Ras Shetan. However, others prefer to walk one side of the ‘triangle’ at a time. Other people prefer to do it in even shorter sections, sometimes just 1-2 days at a time, completing the trail over several years. The green routes signify the routes on which you can join or leave the Sinai Trail. It is possible to walk between any of the region’s major towns, following the trail this way. For more information about our upcoming trips please click here. The orange side of the triangle is mostly a lowland desert walk, through canyons, long, winding wadis, and desert plains, but there are some challenging mountains on the way, including Jebel Feirani and Jebel Sabbah. The turquoise side of the triangle is significantly more challenging, with much more ascent and descent; this route winds through the highest mountains of the Sinai, summitting the Sinai’s most iconic peaks, and it involves significant stretches of scrambling and walking on poor, loose trails. The dark blue side of the triangle is a classic traverse through one of the greatest sand deserts in the Sinai: the Bedouin simply call it ‘El Ramla’: ‘The Sand’. There are canyons along the way and the route also ascents tabletop mountains, but it is not as challenging as the turquoise side of the trail. The green routes signifiy classic short routes on which the main trail can be easily accessed or departed. The map below shows the Sinai Trail as a single orange line, with the place names written in Arabic script.